Two women -- one a nail salon employee and one a customer -- face charges in connection with a wild brawl that broke out a Brooklyn shop last week, allegedly over a botched eyebrow job, according to authorities and a published report. Video posted to Facebook by another customer who happened to be inside New Red Apple Nails on East Flatbush's Nostrand Avenue when the chaos broke out around 9:30 p.m. Friday shows the worker wielding a broom and repeatedly whacking the customer in the back and shoulder area. Other people in the salon grab at the customer's backpack; she eventually makes her way to the front door, the broom-wielding employee still bashing her at every opportunity, and leaves. Then the worker with the broom comes back in, grabs her arms as if rolling up her sleeves, and proceeds to attack another woman with the broom. The woman who posted the video said the first customer was unhappy with her eyebrow job and refused to pay, leading to the fracas. Her footage has been viewed nearly a million times since it was posted on Friday. News 4 also obtained surveillance video from inside the store that shows the chaos unfold. Manager Michael Lin confirmed the customer didn't want to pay so staffers blocked the door -- then the confrontation turned physical. "She said she didn't like it and doesn't want to pay for nothing," said Lin. He added, "I said 'sit down, let me call the police. If the police say you can go, you pay nothing. (If the) police say you pay for the pedicure, then you pay for the pedicure. No eyebrow, no problem.'" The 32-year-old worker faces charges of assault, menacing, harassment and criminal possession of a weapon, among other crimes. 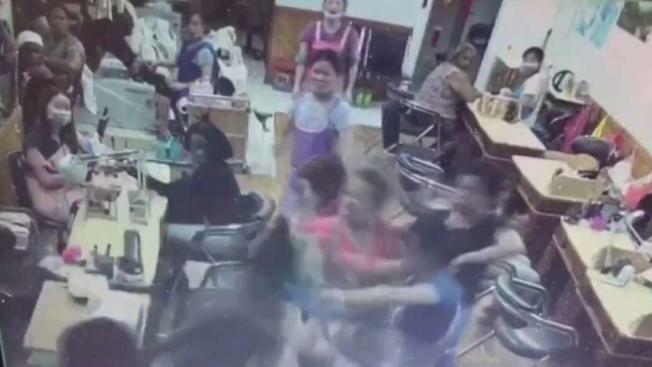 The customer also face charges; a criminal complaint against her alleges she punched and slapped another salon worker and dragged her across the nail salon floor. About 100 people, some of them with Black Lives Matter signs, gathered outside the nail salon Monday to protest. Some of the demonstrators called for the salon to be closed down. "It is blatant disrespect," said Chase Andy. "It is disgusting that they can treat our people in this manner." The salon closed early for the day on Monday, as demonstrators gathered. A spokesman for the Brooklyn District Attorney’s Office said in a statement to News 4 that the investigation is ongoing.